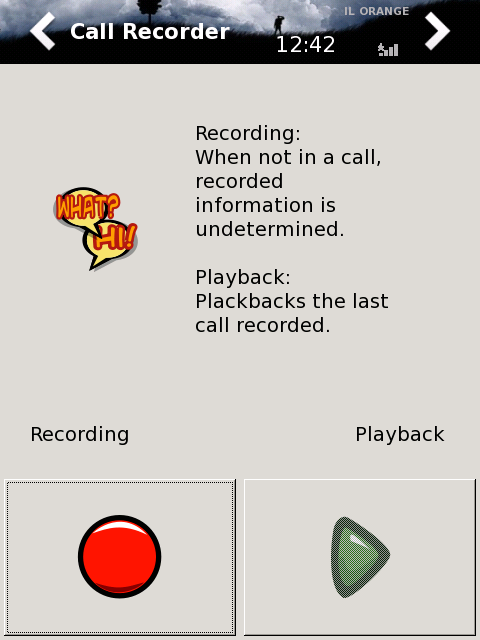 This project is a gtk application to record calls on the openmoko. It backups the current state files and puts it's owns (will soon backup and patch instead). To start recording, just initiate a call, open the app and start recording. The files are saved at the user's home dir and they are of the type: call_MMDDYY_HHMMSS.wav. It's a two channels wave, one channel is the you, the second is the other side of the call, so you can split them when ever you like. Please note that trying to record while not in a code is not defined, won't crash or anything though will probably will record silence. Distros: tested on SHR should work on all. TARBALL. SVN will reside at projects.openmoko.org when they'll make my page.